their heartfelt gifts to the IMA. from those of Premier Shimon Peres on this matter. urging that the PLO "should be put to the test" of diplomacy. ving R. Friedman, Pace Setter co-chairman; and (lower), Hon. Israeli official involved in Ethiopian absorption. supreme, and the cycle '". * ^ ^ g^. at our first CRC meeting." session of their fourth year of study of the Book of Psalms. Jewish Federation of Greater Fort Lauderdale on Sept. 9. The Court at Palm Aire." seats for me (us) at your special seminar.
? Please send me a free brochure describing The Court. ty Hospital in Pompano Beach. 1:30-7:30 p.m. at Marina Bay Hotel, Route 84 and 1-95. I Goodkin has been a resident of Broward County for 12 years. entele include 17 of the top 20 builders in South Florida. | For further information contact Steven Perry at 563-5202.
bpeal luncheon, to be held at Palm-Aires Main Clubhouse. ase reserve the date. More details to follow. mmunity will hold its annual "UJA Inverrary Pacesetter Ball." Tuesday evening Dec. 17 at the Inverrary Country Club. Widars. More details to follow. png Dec. : at the Woodlands Country Club. |IW reserve the date. More details to follow. 10:30 a.m., announced Samuel K.
is the success of the campaign,"
the members of the Cabinet,"
turnout for the meeting," he said. Breakfast will be held at 10 a.m.
57 St, according to Samuel K.
tact the Federation at 748-8400.
side campaign, from 3 to 5 p.m.
goal is within our reach." Oct. 81 for a breakfast meeting. sion to Poland and Israel. tion's Gait office. 3-5 p.m.
Breakfast and Campaign Kick-off. 9 a.m.
but we didn't believe it. has been to Israel many time*. How to play with their children? be able to enjoy such advantages. campaign was Federation vise president Daniel Cantor. Ml Om i.....Maura* Mi iH. can build the Jewish homeland?" Center from 9 a.m. to 2 p.m.
cover a variety of interest areas. realise their own "high fashion"
board of directors and Hon. if Pslestinisn leader Yasser Arafat refuses to accept US. who would agree with me. Egypt to meet with President Natter. blems. Jewish organisations ought not to undertake political""
- except when Israel asks them to." 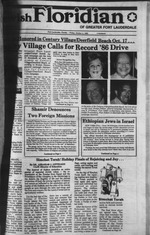 Friday, Octgberj, 19Whe Jewish Floridian of Greater Fort Uuderdale Page 5.
who have similar ideals and goals. turer at the first meeting. Dr. I picture it in my mind." ""ho need it." he added. might get shot at or something." meaning for me," he said. sperity that is perfectly capable"
operate in the fullest way." Ulls for Chef Boy-ar-dee Cheese Ravioli. ram K .^mx ^ i*^a^n, gjHkandpeppr'-"
Available to B'nai B'rith membsrs under age 65 and their families. Please contact sae personally or by small. way that it is going. of the past. Thus, for example. have prayed out of powerlessness. i be seen in the "Met"
fices located at 3856 N.E. 34th St.
led by Laura Hochman. On Nov.
president Alfred Cohen chants the words. --------' -^TZl-M. ~~k. nMMCMifoiv oom. hom nuaat.caawg cam, ooq casa. Federal, 3000 N. University Dr.
Deicke Aud., 5701 Cypress Rd..
West Broward Chapter: 1 p.m.
W. Oakland Pk. Blvd. 748-1724. Lakes Library. 3521 NW 43 Ave.
lit to welcome the Sabbath? designating a Jewish Babe Ruth? 5- Yes, Andy Cohen in 1928. 7 Abraham S. W. Rosenbach. Ridge General Hospital. 5757 N.
4850 NW 22 Ct. Lauderhill. Meeting. At Federation. 8358 W.
Center. 9101 NW 57 St. 742-7615. West Broward Chapter: 10 a.m.
v And it's really something to celebrate. > tosher meals for those who wish them. Oct. 5 service at Temple Beth Orr. van at the Saturday morning Oct.
5 service at Temple Beth Israel. Nov. 13. "Out of the Ashes." cheon at 11:30 a.m. Sunday Oct.
appraise* is available upon request. Tic* Friday 8pm aad Saturday at t am Bahhi Mt Oaky. Fnday cvaaiag at 8 Saturday and Sunday 8 am Bahhi Saaaai Apri. pm. Saturday 8:46 a.m Chartaa a Friar. Finllwl. 8 am. 6 pat.. Saturday A45 am. 6 pa Caatar Paal Staart. Park W*K- Suariaa. 32221 ilaaa. Sanday throagh Friday 8 a*. " 111 to the Tarleton Hotel. Uon of ARMDI in Israel. of officers for the 1985-86 year. have a catered affair," she joked. to open their hearts a little. a sick friend," she urges. some light on it or them." Volunteer of the year in Broward. known lecturer on Israeli affairs. 3-Day Spring Holiday In Israelite! 18; 19 days, $4,110 to $9,580, free round trip airfare included.